Ori starcraft have entered our galaxy, bent on converting or destroying all unbelievers. No match for the vast enemy ships, the remnants of the defeated allied armada now drift in space. Odyssey is badly damaged, and Carter, who witnessed the devastation during an EVA mission, now floats helplessly in space. Teal'c, aboard a Lucian mothership, is taken prisoner by a vengeful Netan, and the fate of Daniel, who was aboard the Korolev when it exploded, is unknown. Meanwhile, aboard the Ori flagship, Vala gives birth to a daughter, the Orici in flesh and blood who will be the beacon of light to the Ori warriors who will vanquish all unbelievers. Vala's daughter is brought before her, but the genetically altered infant is already a child with uncanny powers, and she accepts Vala's offer of a name - Adria. Daniel is also hiding aboard the Ori ship, having escaped through Korolev's rings before its destruction. Carter is rescued as Mitchell pilots Odyssey in a delicate maneuver to scoop her up from space and bring her aboard. Meanwhile, Odyssey faces Netan who orders their surrender, but when Bra'tac arrives with ships of his own, the Lucian Alliance retreats, just as Odyssey beams Teal'c aboard. Bra'tac brings grave news, however. The Ori ships have emerged from hyperspace over Chulak. Teal'c, Carter, and Mitchell join Bra'tac aboard his mothership to defend Chulak, hoping to reunite with Daniel and to plant an explosive device aboard an Ori ship. Meanwhile, as the battle over Chulak rages, Daniel and Vala plan to escape from the Ori and to take young Adria with them. 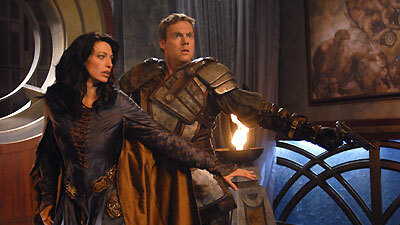 However, Bra'tac's weapon fails to detonate, and Vala and Daniel are apprehended and brought before Adria. As Bra'tac attempts to ram the Ori ship with his own, and Daniel and Vala attempt to make their escape, all are beamed aboard the Odyssey. Safe for the moment, the team must now consider a new plan against a powerful enemy and seemingly insurmountable odds. Upon the birth of the Orici, the Prior quotes: "Calium videre eessit, et eraos ad sidera tollere vultus. She belongs to all who follow the path. Ex uno disce omnes (From one, all will learn). She is Orici. Such is her purpose. In this vast expanse that is sheltered by evil and led astray, she will be the beacon of light in the darkness to the warriors of the Ori and to all who follow the true path to salvation. With the wisdom of the ages, she will lead us to glorious victory over any and all unbelievers." The Orici is the Ori's way of cheating the ascended rule book. They couldn't encroach on our galaxy themselves without getting into a confrontation with the Ancients, so they used Vala to sneak one of their own into the galaxy, their own human representative with their knowledge to lead their armies. Vala says that her mother's name was Adria, and she always wanted to name her daughter after her. In reality, Adria was her stepmother, a witch of a woman. Black box data from the Korolev indicates six people escaped using beaming technology and the rings were activated before the ship was destroyed. It takes a minimum of 3 weeks for a 304 to get to Atlantis one-way.